The Speak & Spell line is a series of electronic hand-held child computers by Texas Instruments that consisted of a TMC0280 linear predictive coding speech synthesizer, a keyboard, and a receptor slot to receive one of a collection of ROM game library modules (collectively covered under patent ‹See Tfd›US 3934233 ). The first Speak & Spell was introduced at the summer Consumer Electronics Show in June 1978, making it one of the earliest handheld electronic devices with a visual display to use interchangeable game cartridges. The Speak & Spell was named an IEEE Milestone in 2009. The Speak & Spell was created by a small team of engineers led by Paul Breedlove, himself an engineer, with Texas Instruments (TI) during the late 1970s. Development began in 1976 with an initial budget of $25,000, as an outgrowth of TI's research into speech synthesis. The completed proof version of the first console utilized TI's trademarked Solid State Speech technology to store full words in a solid state format similar to the manner in which calculators of the time stored numbers. Additional purchased cartridges (called expansion modules) could be inserted through the battery receptacle to provide new solid-state libraries and new games. This represented the first time an educational toy utilized speech that was not recorded on tape or phonograph record (as with Mattel's See 'n Say line or the earlier Chatty Cathy dolls). The original Speak & Spell was the first of a three-part talking educational toy series that also included Speak & Read and Speak & Math. This series was a subset of TI's Learning Center product group and the Speak & Spell was released simultaneously with the Spelling B (a non-speech product designed to help children learn to spell), and the First Watch (designed to teach children to read digital and analog timepieces). The Speak & Spell was sold, with regional variations, in the United States, Canada, Australia, in Europe, and Japan. The toy was originally advertised as a tool for helping children ages 7 and up to learn to spell and pronounce over 200 commonly misspelled words. It shipped without a cartridge, in this configuration called simply the Basic Unit (containing the minigames, Mystery Word, Secret Code, and Letter). Between its release and 1983, the Speak & Spell was redesigned twice under the name Speak & Spell. It was completely recreated in 1982 as the Speak & Spell Compact (a version lacking a visual display), and in 1989 the Super Speak & Spell was released to replace the original vacuum fluorescent display (VFD) with a liquid crystal display (LCD). Between 1989 and 1992 the Super Speak & Spell would see three redesigns as well. The 1992 Super Speak & Spell would mark the last release of the series. Regional variations with different speech libraries and different games were released in at least 9 countries with seven language variations. Because the linguistic aspect of the games played on the Speak & Spell are of central importance to Speak & Spell titles, separate cartridge libraries were developed for English (including American and British), Japanese, German, French, Italian, and Spanish markets. Beyond the natural disinclination of consumers to purchase games in foreign languages, however, regional lockout does not prevent the use of expansion module cartridges in consoles for which they were not designed. Since the layout of foreign editions is nearly identical (the only major differences being graphics, color, and placement of power/headset jacks), and the cartridges lacked a lockout, cartridges often bore instructions in multiple languages despite their designation for consumer groups that might not understand the language. In 1980, the original Speak & Spell was redesigned to give it a membrane keyboard in place of raised buttons. This version was nearly identical to the first release and with backward compatible cartridge recognition common to all Speak & Spells except the first version of the Super Speak & Spell, the entire library of cartridges from the original release were available to the 1980 release. Outside of the United States, the 1980 release was marketed in the United Kingdom under the same name, in German as the Buddy (employing an umlaut in place of the Speak & Spell's apostrophe), and in French as La Dictée Magique (lit. The Magical Dictation). In 1982, the Speak & Spell Compact was released at about half the size of the Speak & Spell and lacking the VFD screen. The Speak & Spell Compact was a dedicated console and only one other version, the Speak & Write, was released for English markets. Speak & Spell Compact sales were very poor in the United States, causing TI to send much of its excess stock abroad. UK Marketing Manager Martin Finn had the product retitled for the UK, and all existing units were recolored blue and repackaged. In 1983, the Speak & Spell was again redesigned. The change was even more minute, however, representing nothing more substantial than a redesign of the faceplate graphics. This version was marketed first in Italian as Grillo Parlante (lit. the Talking Cricket as the character of the book for children The Adventures of Pinocchio), and then later in the United States and the United Kingdom as the Speak & Spell, and in France as the Dictée Magique again. The Super Speak & Spell was released in 1989 with a number of major changes. The display screen was changed to an LCD screen instead of the former VFD screen. The keyboard layout was also altered to match the standard QWERTY keyboard rather than the ABC keyboard. The general structure of the console was also altered so that the handle which had come at the top of the screen in prior Speak & Spells was now found on the bottom of the toy and ergonomic features were added to the shape. Furthermore, game cartridges for the Super Speak & Spell were changed so that they were incompatible with prior Speak & Spells and the cartridge slot was similarly altered to prevent backward compatibility. The following year the Super Speak & Spell was again majorly redesigned to return to a considerable degree to its prior Speak & Spell form. This version re-adopted the handle-on-top look of the previous models and resumed use of the original cartridges. The use of the LCD screen and the QWERTY keyboard were retained; however, the keyboard gained an additional 5 letters (6 in some regions) to correspond with letters requiring diacritics. It was marketed first in Spanish as El Loro Parlanchín (The Chatty Parrot), and then later in the United States as the Super Speak & Spell, in French as La Super Dictée Magique, and in Italian as Grillo Parlante Più (lit. Speaking Cricket Plus). In 1992, a third redesign of the Super Speak & Spell was made for the Spanish market only. The new version was nearly identical to the prior El Loro Parlanchín save for the name which became El Loro Profesor (Professor Parrot). The Speak & Spell used the first single-chip voice synthesizer, the TMC0280, later called the TI TMS5100, which utilized a 10th-order linear predictive coding (LPC) model by using pipelined electronic DSP logic. A variant of this chip with a very similar voice would eventually be utilized in certain Chrysler vehicles in the 1980s as the Electronic Voice Alert. Speech synthesis data (phoneme data) for the spoken words were stored on a pair of 128 Kbit metal gate PMOS ROMs. 128 Kbit was at the time the largest capacity ROM in use. Additional memory module cartridges could be interchangeably plugged into a slot in the battery compartment and selected via a button on the keyboard. The technique used to create the words was to have a professional speaker speak the words. The utterances were captured and processed. Originally all of the recording and processing was completed in Dallas. By 1982 when the British, French, Italian and German versions were being developed, the original voices were recorded in the TI facility near Nice in France and these full bit rate digital recordings were sent to Dallas for processing using a minicomputer. Some weeks later the processed data was returned and required significant hand editing to fix the voicing errors which had occurred during the process. The data rate was so radically cut that all of the words needed some editing. In some cases this was fairly simple, but some words were unintelligible and required days of work and others had to be completely scrapped. The stored data were for the specific words and phrases used in the Speak & Spell. The data rate was about 1,000 bits per second. The video-display employed in the Speak & Spell was a vacuum fluorescent display (VFD). The later Super Speak & Spell model, had a much slimmer case and an LCD screen rather than a VFD screen. The unit could use either 4 "C" batteries or 6 volt DC power adapter with positive tip polarity. Cartridges (also known as expansion modules) are freely exchangeable ROM libraries that provide additional content without providing additional functionality. These cartridges are plugged into a slot near the battery compartment in order to introduce new software libraries. Word and game lists are of differing lengths depending upon the cartridge and the word lists in models marketed for different languages reflect the language marketed for. Separate word lists also exist for regional variants such as the American and British English versions. The word list used in each of the regional models reflects the recommendations of educators in each country. The English, French, German and Italian versions were all created by a team of non-specialists, in TI's plant near Antibes, France, under the watchful eye of Larry Brantingham who had patented the underlying technology. Say It – A word-spelling game where the player must spell ten words after hearing them "spoken" by the unit. The E.T. Fantasy Module tie-in (based on the toy's appearance in the movie E.T. the Extra-Terrestrial) asked players to spell such words as "geranium", "universe", and "creature". Secret Code – A code-generating program in which the player enters a word on the Speak & Spell and the console returns the word in code. Letter – Another algorithm that allows the player to change a word he has entered by shifting its letters several spaces down the alphabet. Drop It – A Super Speak & Spell game in which the player will see how new words are made by adding prefixes and suffixes. Memory – A Super Speak & Spell game in which letter recognition and visual memory skills are tested. Mystery – A Super Speak & Spell game in which letter patterns in words and visual memory are developed. Mix Up – A Super Speak & Spell game in which word patterns and the relationships between letter sounds and spelling are tested. Same As – A Super Speak & Spell game in which homophones are tested. A.C.E. – A Super Speak & Spell game in which abbreviations, contractions, and word endings are tested. Race – A Super Speak & Spell game in which fast recall, accurate spelling, and touch-typing skills are tested with time limits. Several commercial retailers offered hardware and software which allowed home computers to interface with the Speak & Spell's hardware and access its capabilities, and Larry Dighera was first to reveal how that might be accomplished. Percom Data Company offered a PC Card called "Speak-2-Me-2" which installed into the battery compartment of the Speak & Spell, and connected via cable to a TRS-80. East Coast Micro Products offered hardware to interface 6502-based computers such as the Commodore 64 and Apple IIe with the Speak & Spell. A program called "S.peek.uP" was marketed which could control this hardware. The February 1983 issue of Computers & Electronics contained instructions for interfacing a Speak & Spell with a Sinclair ZX-80 a Sinclair ZX-81, or a Timex 1000. Texas Instruments itself later adapted the Speak & Spell's technology into a speech synthesizer accessory for its popular TI-99/4A computer. The Speak & Spell (as well as the "Speak & Math" and "Speak & Read") are emulated, running the original code, by MESS. A number of simulations of the Speak & Spell (not emulations, as they don't run the original code) have shown up online in recent years with varying degrees of functionality. Often programmed for Flash, these are often the result of nostalgic sentiment for the 1980s. A modified Speak & Spell graces the cover of the Hexstatic album, Listen & Learn. The Speak & Spell has been employed in recent years in commercial music as an instrument either in its original form or as a modified "bent" circuit instrument (see below). Artists like French electronic musician Jean Michel Jarre have used the musical samples from the Speak & Spell's opening sequence in their songs. Artists in various other (typically electronic) genres have employed the non-musical vocal portions of the Speak & Spell to create vocal parts in their songs. Thus, Speak-&-Spell-generated speech synthesis has featured in alternative music (with artists such as Beck, Coldplay and Limp Bizkit), electronic music (with such artists as Röyksopp and Robyn and Kraftwerk), synthpop (with such groups as Orchestral Manoeuvres in the Dark, Freezepop, and Erasure), trance music (e.g. Sōta Fujimori), electropop (e.g. TLC), Christian rock (e.g. Resurrection Band, Family Force 5), pop (e.g. Cheetah Girls), and hip hop (e.g. Naya Rivera). English synthpop band Depeche Mode's 1981 debut album, Speak & Spell, is named in reference to the Speak & Spell. Some musicians have also used modified "circuit bent" Speak & Spell units in their compositions. By opening the Speak & Spell's case, cross-wiring terminals, and installing electronic components such as switches and potentiometers, amateur hobbyists purposely disrupt normal functioning of the Speak & Spell's membrane keyboard matrix circuit in order to create new sounds. These modifications act to overwhelm the unit's keyboard switch matrix to produce an effect known in the field of electronics as key jamming or ghosting. This effect can be triggered in the Speak & Spell without making modifications if more than 3 keys in the same row are depressed simultaneously; however, within the circuit bending culture, emphasis is given to the fact that these units are being used as instruments and thus externally manipulable components are often accentuated. Great attention may be given to enhancing the visual aesthetics of the units by adding decorations and repainting "bent" Speak & Spells, and these units have been traded and sold online and within the circuit bender community. Examples of artists who have used circuit bent Speak & Spells in their compositions include Beck, CocoRosie, Eisbrecher, Experimental Audio Research, Fantômas, Scrabbel, Venetian Snares, and Claude Woodward The Sonic Manipulator. The Speak & Spell features in various electronics museums such as the Computer History Museum and the Smithsonian National Museum of American History due to its seminal influence in the field of modern speech synthesis. The Speak & Spell is also featured in the Game On exhibition as an example of a handheld video game. A 1978-model Speak & Spell features prominently as the "phone home" in 1982's E.T. the Extra-Terrestrial (note the raised buttons). The Speak & Spell has shown up in various television shows, films, and game shows. 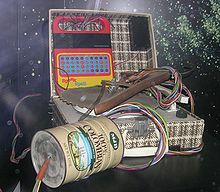 A Speak & Spell has a prominent role as a key component of the alien creature's homebuilt interstellar communicator in the Steven Spielberg motion picture E.T. the Extra-Terrestrial. Speak & Spells also make appearances in movies such as Pixar's Toy Story and Toy Story 2 (where the game device is a character named "Mr. Spell"), Bride of Chucky (where the possessed doll, Chucky plays with one), in Poltergeist III (used by the character Carol Anne Freeling), and in the music videos for the songs "Playgirl" by the synthpop music group Ladytron and "Fireflies" by Owl City. The Speak & Read was released in 1980 with a shape identical to the Speak & Spell but with different game features and a different color scheme. Where the American Speak & Spell had been colored red with yellow and orange accents, the American Speak & Read was yellow with blue and green accents. Game cartridges for the Speak & Read were identical in shape to those of the main Speak & Spell line, and they could be physically inserted into units from the wrong line; however, they did not function except in members of their own line. The Speak & Read was designed to focus on reading comprehension in children of ages 4–8 with a library of over 250 basic words. The Speak & Read was very minutely redesigned in 1986, under the same name, with the new version representing nothing more substantial than a redesign of the faceplate graphics. In 1988 the Super Speak & Read was released as a major redesign to feature a suitcase-like flip-open appearance. Cartridges were redesigned to be thinner and of a different shape, bearing some resemblance to the cartridges of TI's Touch & Discover line. Additionally, the keyboard was removed completely and a matrix of membrane buttons took its place similarly to the position sensitive "keyboard" of the Touch & Discover consoles. Each cartridge came with a work-booklet that would be laid out in an open position in the center of the Super Speak & Read and as questions were asked of the player he would press the appropriate portion of the work-booklet to depress the membrane button beneath. This was the last member of the Speak & Read line under this name; however, the Ready... Set... Read! (sharing a highly similar design layout) and later Magic Reading Desk (featuring a modified Ready... Set... Read! layout) are considered the Speak & Read's spiritual successors. Both Ready... Set... Read! and Magic Reading Desk cartridges are identical in design to the Super Speak & Read's cartridges. The Speak & Math (sold as "Speak and Maths" in some countries) was released in 1980 with a shape identical to both the Speak & Spell and the Speak & Read but with a completely different keyboard layout, different game features, and a different color scheme. Where the American Speak & Spell had been colored red with yellow and orange accents, the American Speak & Math was gray with blue and orange highlights. The Speak & Math was designed to focus on mathematics in children of ages 6–12 with a library of over 100,000 random and preprogrammed problems. It was regarded as the spiritual successor to TI's earlier DataMan series, with the difference mainly relating to the addition of speech synthesizing software and the visual display. The Speak & Math was only released to American and British markets. The Speak & Math was very minutely redesigned in 1986, under the same name, with the new version representing nothing more substantial than a redesign of the faceplate graphics. In 1990 the Super Speak & Math was released as a major redesign similar to the first version of the Super Speak & Spell. As with the Super Speak & Spell, the display screen of the Super Speak & Math was changed to an LCD screen instead of the former VFD screen. The keyboard was also expanded and given more functions. The general structure of the console was also altered similarly to the Super Speak & Spell such that the handle which had come at the top of the screen in prior Speak & Math units was now found on the bottom of the toy and ergonomic features were added to the shape. Speak & Learn Magic Wand – A work-booklet-based electronic game featuring the use of infra-red barcode reader technology. Speak & Music – A musical audio game allowing free-form and memory-based (rhythm memory, eidetic musical memory, etc.) gameplay. Ready... Set... Read! – Considered the spiritual successor to the Speak & Read line. Magic Reading Desk – Considered the spiritual successor to the Ready... Set... Read! and Speak & Read lines. Little Maestro – A musical audio game aimed at younger children than the Speak & Music. Touch & Tell – A 1978 educational game aimed at children of ages 2 to 5 employing a position-sensitive keyboard. A synthesized voice asked children questions and kids touch the answers on the keyboard. Teddy Touch & Tell – The next generation of the Touch & Tell game, Teddy Touch & Tell is shaped like a bear and educates children on the topics of the alphabet, numbers, colors, animals, and music. Touch & Discover – An educational game employing a position-sensitive membrane matrix keyboard. The Touch & Discover is considered the precursor to the Super Speak & Read. Disney licensed their characters to Texas Instruments for this toy, and Touch & Discover employed the "first ever" synthesized voices of Disney characters. Touch & Discover School Edition – The next generation of the Touch & Discover console, the Touch & Discover School Edition is aimed at a slightly older audience. Touch & Talkies – A dedicated handheld series, there were four versions of Touch & Talkies all aimed at very young players. Listen & Learn – The first electronic, educational toys to be marketed to infants, the Listen & Learn toys were a series of three themed, electronic toys aimed at children of between 6 and 36 months. These toys were dodecahedron (12-sided) ball-shaped, were motion and directionally sensitive. The toy reacted to which side landed on top when rolled, and produced a sound corresponding to the picture on top. ^ Texas Instruments Handheld Games Archived 24 December 2008 at the Wayback Machine Console Passion Retro Games. Retrieved 18 December 2008. ^ a b c Speak & Spell. Computer History Museum. Retrieved 18 December 2008. ^ Handheld archive search results [S]. Handheld Remakes. Retrieved 18 December 2008. ^ a b c d e f g "Module Information". Speak & Spell Manual. Texas Instruments. 1980. ^ a b c d e "TI Talking Learning Aid Sets Pace for Innovative CES Introductions" (Press release). Texas Instruments. 11 June 1978. Retrieved 17 December 2008. ^ a b Texas Instruments Collection – Learning Aid. Smithsonian NMAH. Retrieved 18 December 2008. ^ "Milestones:Speak & Spell, the First Use of a Digital Signal Processing IC for Speech Generation, 1978". IEEE Global History Network. IEEE. Retrieved 29 July 2011. ^ Speak & Spell introduced – first commercial use of DSP technology. Texas Instruments. Retrieved 17 December 2008. ^ Woerner, Joerg. Texas Instruments Speak & Spell (English Voice Type 1). Datamath Calculator Museum. 14 July 2005. ^ Coopee, Todd. "Speak & Spell from Texas Instruments (1978)". ToyTales.ca. ^ a b Texas Instruments. Abledata. Retrieved 17 December 2008. ^ Woerner, Joerg. Texas Instruments Speech Products. Datamath Calculator Museum. 13 January 2001. ^ a b c d e f g h Woerner, Joerg.Additional Pictures . Datamath Calculator Museum. 23 December 2007. ^ a b Gregory, Chris and Woerner, Joerg. Texas Instruments Speak & Spell (Type 2). Datamath Calculator Museum. 25 January 2002. ^ Woerner, Joerg. Texas Instruments Speak & Spell (English Voice Type 2). Datamath Calculator Museum. 13 July 2005. ^ Woerner, Joerg. Texas Instruments Buddy. Datamath Calculator Museum. 5 December 2001. ^ Woerner, Joerg. Texas Instruments La Dictée Magique Datamath Calculator Museum. 5 December 2001. ^ Bohlig, Dirk and Woerner, Joerg. Texas Instruments Speak & Spell Compact. Datamath Calculator Museum. 5 December 2001. ^ Woerner, Joerg. Texas Instruments Speak & Write. Datamath Calculator Museum. 5 December 2001. ^ Woerner, Joerg. Texas Instruments Grillo Parlante. Datamath Calculator Museum. 5 December 2001. ^ Woerner, Joerg. Texas Instruments Speak & Spell (Type 3). Datamath Calculator Museum. 5 December 2001. ^ Woerner, Joerg. Texas Instruments Speak & Spell (English Voice Type 3). Datamath Calculator Museum. 3 December 2007. ^ Woerner, Joerg. Texas Instruments La Dictée Magique (Type 2). Datamath Calculator Museum. 28 October 2008. ^ a b c d e f g h Woerner, Joerg. Texas Instruments Super Speak & Spell. Datamath Calculator Museum. 5 December 2001. ^ a b c d Woerner, Joerg. Additional Pictures . Datamath Calculator Museum. 23 December 2007. ^ a b c Woerner, Joerg. Additional Pictures . Datamath Calculator Museum. 23 December 2007. ^ Woerner, Joerg. El Loro Parlanchín. Datamath Calculator Museum. 6 May 2007. ^ Woerner, Joerg. Texas Instruments Super Speak & Spell (91). Datamath Calculator Museum. 5 December 2001. ^ Woerner, Joerg. Texas Instruments Grillo Parlante Più. Datamath Calculator Museum. 6 May 2007. ^ Woerner, Joerg. Texas Instruments El Loro Profesor. Datamath Calculator Museum. 25 September 2002. ^ Finn, Martin. "Speak & Spell". Smart-Tactics. Retrieved 24 October 2016. ^ a b c d e f g h i Woerner, Jeorg. Additional Pictures . Datamath Calculator Museum. 23 December 2007. ^ TI number: S00461. Smithsonian NMAH. 2000. ^ TI number: S00463. Smithsonian NMAH. 2000. ^ TI number: S00467. Smithsonian NMAH. 2000. ^ TI number: S00462. Smithsonian NMAH. 2000. ^ TI number: S00464. Smithsonian NMAH. 2000. ^ TI number: S00465. Smithsonian NMAH. 2000. ^ TI number: S00466. Smithsonian NMAH. 2000. ^ Woerner, Joerg. Additional Pictures . Datamath Calculator Museum. 23 December 2007. ^ Woerner, Joerg. Additional Pictures . Datamath Calculator Museum. 8 May 2008. ^ a b "Talk Can Be Cheap," Dighera, Larry. . Computers & Electronics. February 1983. ^ A Brief History of the TI-99. Texas Instruments. Retrieved 18 December 2008. ^ Hill, Alice. Speak & Spell Online Emulator. RealTechNews. Retrieved 18 December 2008. ^ Smith, Jake. Welcome to Speak & Spell Online. Speaknspell.co.uk. 2002. ^ St.Onge, Kevin. Speak & Spell Emulator. KevinStOnge.com. May 2006. ^ Jarre, Jean Michel "Touch to Remember." Téo & Téa. 26 March 2007. ^ Beck. The Information. 3 October 2006. ^ Limp Bizkit. "Behind Blue Eyes". Results May Vary. 23 September 2003. ^ Erlewine, Stephen Thomas. "Results May Vary – Limp Bizkit". Allmusic. Retrieved 7 January 2012. ^ Marchand, Francois (27 May 2014). "Album of the Week: Röyksopp & Robyn, Do It Again". The Vancouver Sun. Postmedia Network. Retrieved 26 June 2014. ^ Kraftwerk. Computer World. May 1981. ^ Orchestral Manoeuvres in the Dark. Dazzle Ships. 4 March 1983. ^ Freezepop. "I Am Not Your Gameboy." Fancy Ultra•Fresh. 20 April 2004. ^ Erasure. "Brother and Sister". Wild!. 16 October 1989. Erasure. "Sweet, Sweet Baby". Drama!. 18 September 1989. ^ Konami Computer Entertainment Tokyo (20 September 2001). Dance Dance Revolution 5thMix (in Japanese). Sony PlayStation. KCET. Level/area: Look to the Sky. ^ TLC. "FanMail." FanMail. 23 February 1999. ^ Resurrection Band. "SOS." Hostage. 1984. ^ Family Force 5. "Cadillac Phunque." Business Up Front/Party in the Back. 21 March 2006. ^ Cheetah Girls. "Dig a Little Deeper." The Cheetah Girls: One World. 19 August 2008. ^ Naya Rivera. "Sorry". 17 September 2013. ^ CocoRosie. "Animals." The Adventures of Ghosthorse and Stillborn. 10 April 2007. ^ Eisbrecher. Sünde. 22 August 2008. ^ Fantômas. Suspended Animation 5 April 2005. ^ Venetian Snares. Huge Chrome Cylinder Box Unfolding. 14 June 2004. ^ "The Sonic Manipulator-The Spaceman-Sci Fi Sounds-Space Music-Musical Inventions". Sonicmanipulator.com. 28 February 2005. Retrieved 13 August 2012. ^ Playable Games. Game On. 17 November 2008 – 15 February 2009. ^ a b Woerner, Joerg. Texas Instruments Speak & Read (Type 1). Datamath Calculator Museum. 5 December 2001. ^ Ghazala, Reed. Circuit-Bending: Build an Incantor. Make. 24 October 2005. ^ Woerner, Joerg. Texas Instruments Speak & Read (Type 2). Datamath Calculator Museum. 5 December 2001. ^ Woerner, Joerg. Texas Instruments Super Speak & Read. Datamath Calculator Museum. 5 December 2001. ^ a b c Woerner, Joerg. Additional Pictures . Datamath Calculator Museum. 27 June 2005. ^ Woerner, Joerg. Texas Instruments Touch & Discover. Datamath Calculator Museum. 5 December 2001. ^ a b Woerner, Joerg. Texas Instruments Ready..Set...Read!. Datamath Calculator Museum. 15 December 2001. ^ a b Woerner, Joerg. Texas Instruments Magic Reading Desk. Datamath Calculator Museum. 5 December 2001. ^ Woerner, Joerg. Additional Pictures . Datamath Calculator Museum. 28 December 2007. ^ a b Speak & Math Educational Product. Smithsonian NMAH. 15 June 1980. ^ Woerner, Joerg. Texas Instruments Speak & Math (Type 1). Datamath Calculator Museum. 5 December 2001. ^ Woerner, Joerg. Texas Instruments DataMan. Datamath Calculator Museum. 5 December 2001. ^ Woerner, Joerg. Texas Instruments Les Maths Magiques. Datamath Calculator Museum. 12 July 2005. ^ Woerner, Joerg. Texas Instruments Maths marvel. Datamath Calculator Museum. 5 December 2001. ^ Worener, Joerg. Texas Instruments Dotto Conta-Parla. Datamath Calculator Museum. 15 March 2004. ^ Woerner, Joerg. Texas Instruments le Calcul magique. Datamath Calculator Museum. 5 December 2001. ^ Woerner, Joerg. Texas Instruments Mathe-Fix. Datamath Calculator Museum. 5 December 2001. ^ Woerner, Joerg. Texas Instruments Speak & Math (Type 2). Datamath Calculator Museum. 25 December 2001. ^ Woerner, Joerg. Texas Instruments Super Speak & Math. Datamath Calculator Museum. 5 December 2001. ^ Goudie Marshall, Kathleen M. and Worner, Joerg. Texas Instruments Speak & Learn Magic Wand Archived 3 February 2009 at the Wayback Machine. Datamath Calculator Museum. 5 December 2001. ^ Woerner, Joerg. Texas Instruments Speak & Music. Datamath Calculator Museum. 5 December 2001. ^ Woerner, Joerg. Texas Instruments Little Maestro. 5 December 2001. ^ Woerner, Joerg. Texas Instruments Touch & Tell. Datamath Calculator Museum. 5 December 2001. ^ Woerner, Joerg. Texas Instruments Teddy Touch & Tell. Datamath Calculator Museum. 15 December 2001. ^ Ribalta, Gail Susik, Texas Instruments Consumer Products 1988–1994. ^ Woerner, Joerg. Texas Instruments Touch & Discover School Edition. Datamath Calculator Museum. 27 June 2005. ^ Woerner, Joerg. Texas Instruments Touch & Talkies "Shuttle Buddies". Datamath Calculator Museum. 5 December 2001. ^ Ribalta, Gail Susik, Toy Developer at Texas Instruments, Consumer Products 1988–1994. This page was last edited on 27 February 2019, at 13:18 (UTC).